Summer is almost here. With that time comes tons of fruits and veggies. They’re just so refreshing! There’s nothing better than sinking your teeth into a juicy, sweet, refreshing, and delicious watermelon. Am I right? Unfortunately, you have some things to worry about when it comes to eating all of nature’s goodness. You need to make sure it’s organic. 1. Keeps chemicals off your plate: Did you know many approved pesticides were registered long before extensive research linked these chemicals to cancer and other diseases? 2. Protects future generations: Children are four times more sensitive to exposure to cancer-causing pesticides in foods than adults. 3. Protects water quality: Pesticides pollute the public’s primary source of drinking water for more than half the country’s population. 4. Organic farmers work in harmony with nature: Organic agriculture respects the balance necessary for a healthy ecosystem; wildlife is encouraged by including forage crops in rotation and by retaining fencerows, wetlands, and other natural areas. 5. Saves energy: More energy is now used to produce synthetic fertilizers than to till. 6. Helps small farmers: Although more and more large- scale farms are converting to organic practices, a majority of organic farms are small, independently owned and operated family farms. 7. Supports a true economy: Organic foods might seem expensive at first. However, your tax dollars pay for hazardous waste clean-up and environmental damage caused by conventional farming. 8. Promotes biodiversity: Planting large plots of land with the same crop year after year tripled farm production between 1950 and 1970, but the lack of natural diversity of plant life has negatively affected soil quality. 9. Nourishment: Organic farming starts with the nourishment of the soil, in turn producing nourishing plants. Well-maintained soil produces strong, healthy plants that have more nutrients than conventionally grown produce. 10. Flavor: Organic produce simply tastes better. Not to mention, organic produce gets pretty pricey. I’m going to give you a few tricks for saving a little extra for your next trip to the grocery store. The next list is considered the “dirty” list and you’ll want to buy these organic. Pour ingredients into a spray bottle. Gently shake to mix. 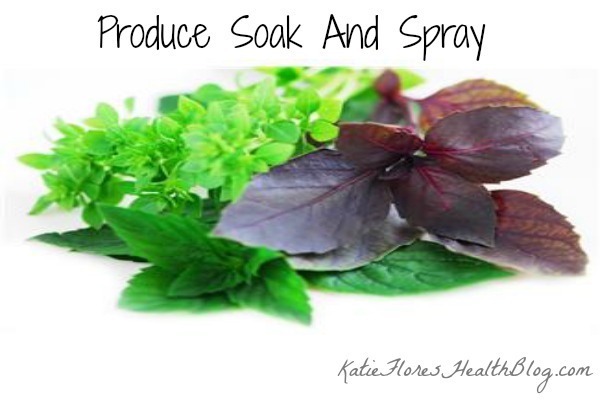 Spray produce, let it sit for 1-2 minutes, then rinse well. Store in refrigerator between uses. Soak fruits or veggies for at least 2-5 minutes. Remove from soak and rinse well.